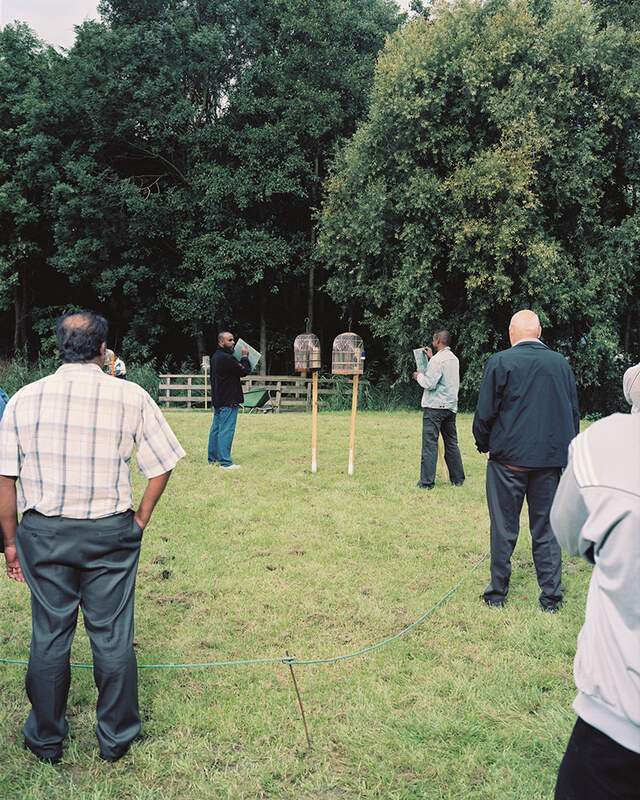 The men of bird club Beef-Free (founded in 1980) meet every Sunday during the summer months. 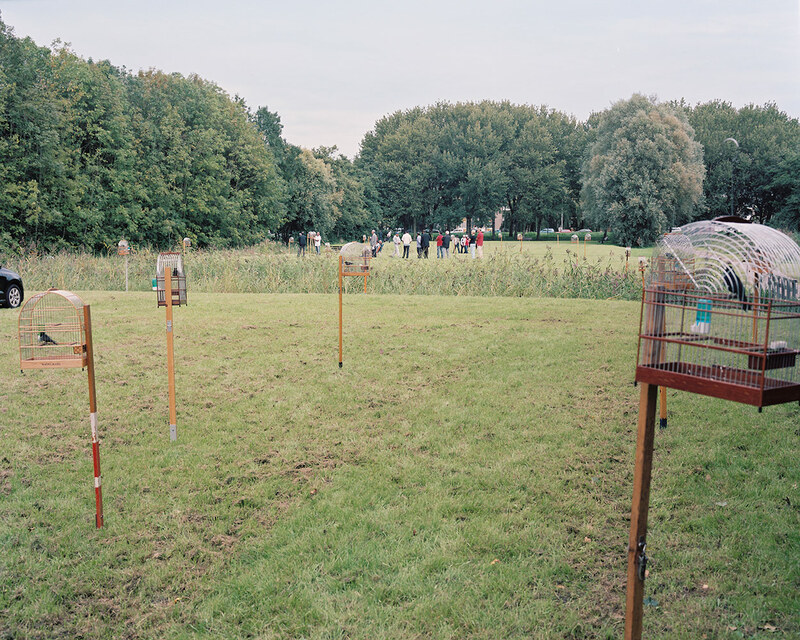 In a park at the Lozerlaan in The Hague Southwest they show off their birds, and have competitions. The phenomenon is well known in Suriname. Often you see men in the street with a small portable cage hanging on a (foldable) stick. 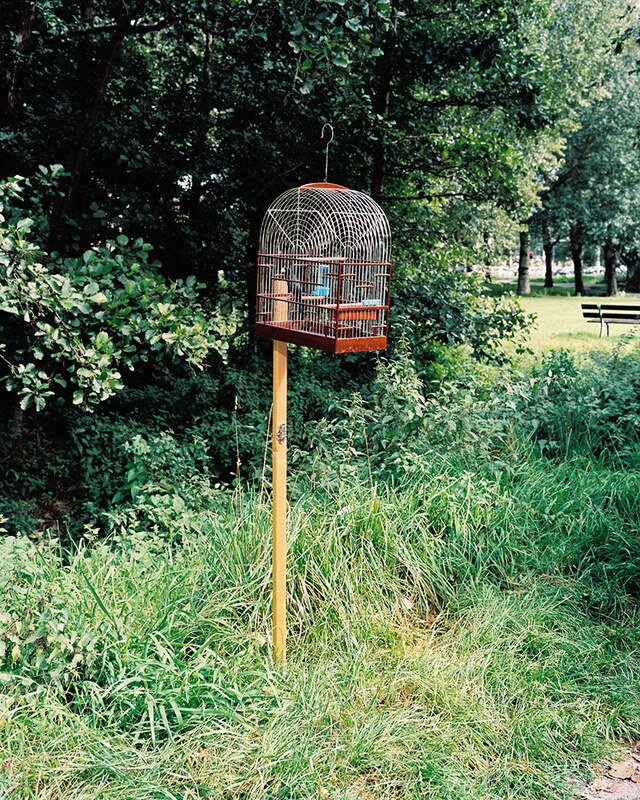 The cage usually contains a small black bird, a Twa-Twa, or a slightly smaller brown bird, a Picolet. They sing beautifully. Beef-free is literally translated as’ wings quivering. If a male sees a female it will start flapping its wings and start a birdsong to seduce or impress her. The matches start early, sometimes at 7:30 am. 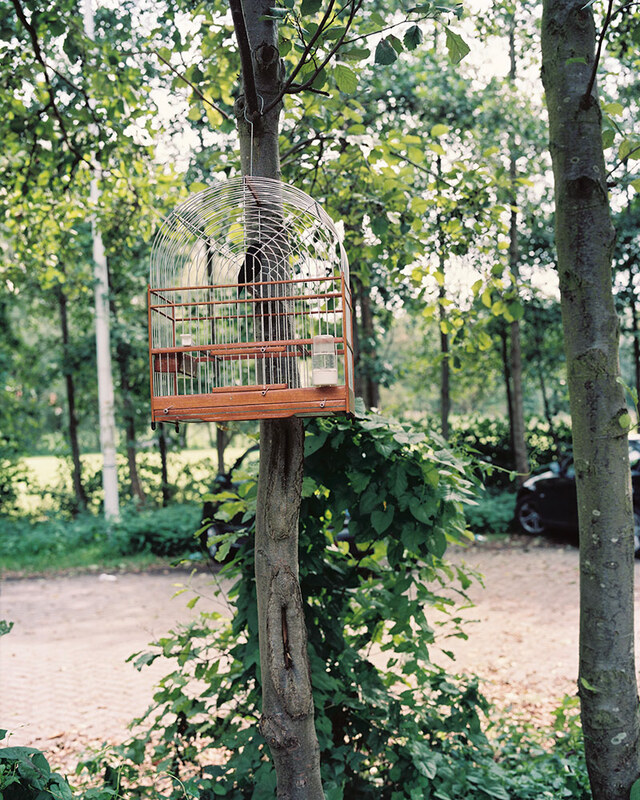 The actual game is held within a defined plot, two bird cages stand side by side. Spectators keep a proper distance. Two referees are keeping the score using a chalk stick, writing on a small blackboard. Every ‘hit’ (birdsong) is recorded. Sometimes it can be 130 times, the one with the most hits wins. 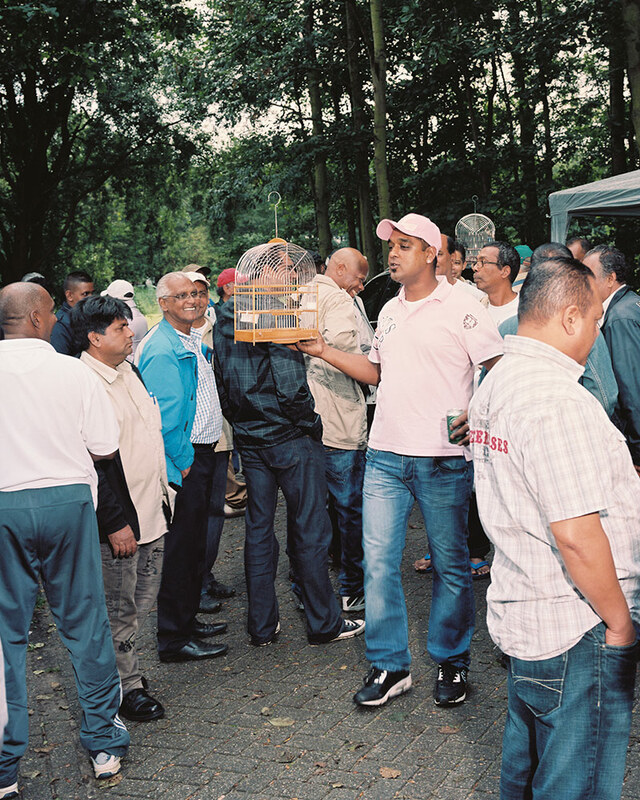 This cultural and social tradition came along with the Surinamese community in the 70s and 80s when they came to the Netherlands to live and work. Unfortunately, the number of practitioners is dwindling here. Only a small number of young people practice the sport. Also it’s a man’s world, women are rarely seen at the games. The only two women I saw were serving delicious roti, bara and had various drinks with them.The season is at its end, some birds are already moulting, meaning they won’t sing no more. This summer’s bad weather didn’t add up to this season’s success either. 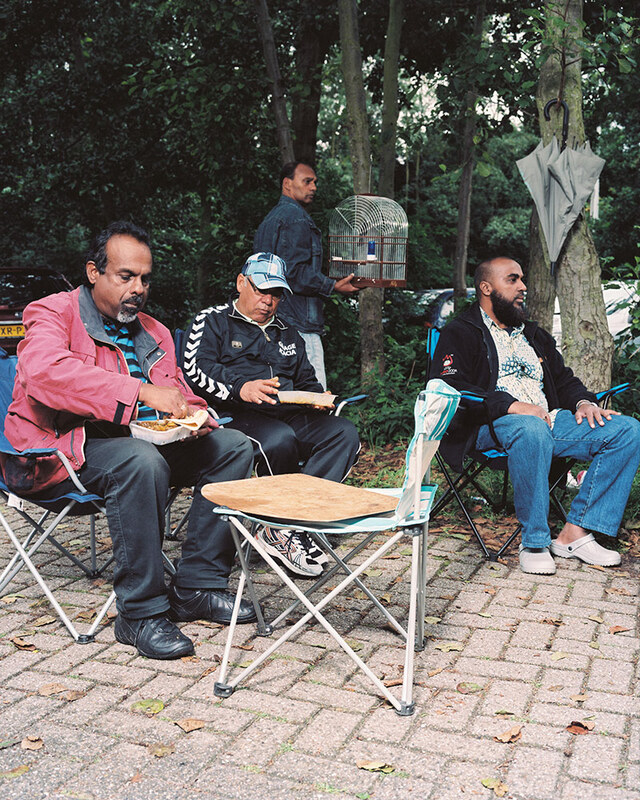 Still, The Hague had a serious contender for the national rankings: Prim. Prim and his bird both have a big mouth, which is good for the sport. 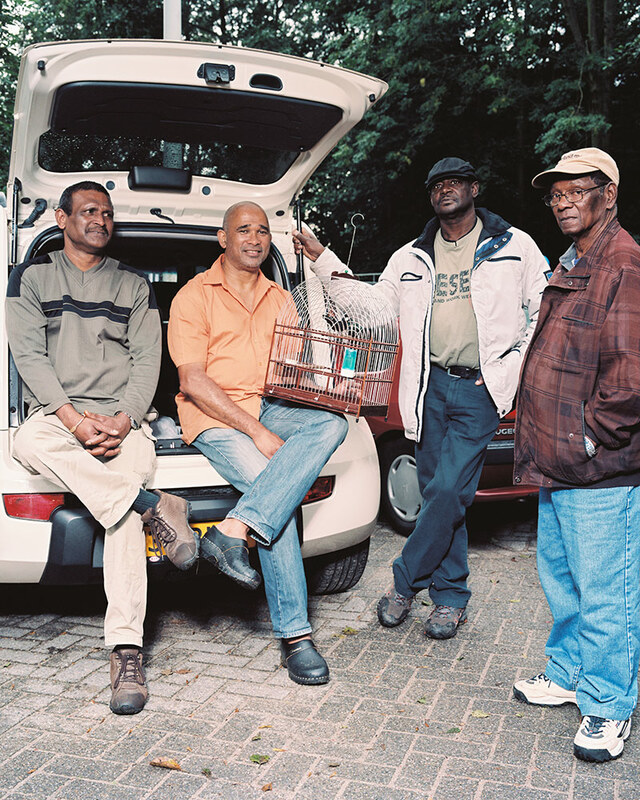 Hard talk and a lot of cursing is important in the Surinamese community. 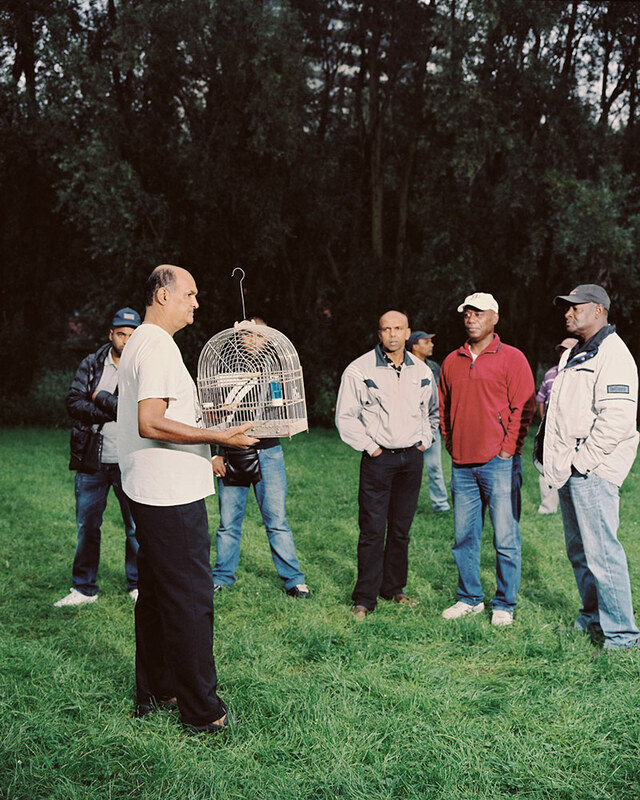 Constantly I thought people were having a row, but “It’s just the way of talking, you know.” Unfortunately for Prim Amsterdam’s Sunil Chidie championed with his bird Labaria (name for a poisonous snake in Suriname). One of the men told me he took the sport so seriously that his wife divorced him. He has about 15 male birds and 10 hens. “At some point My wife gave me a choice: either the she goes or the birds go. I don’t know if I made the right decision, but I let the her go”. 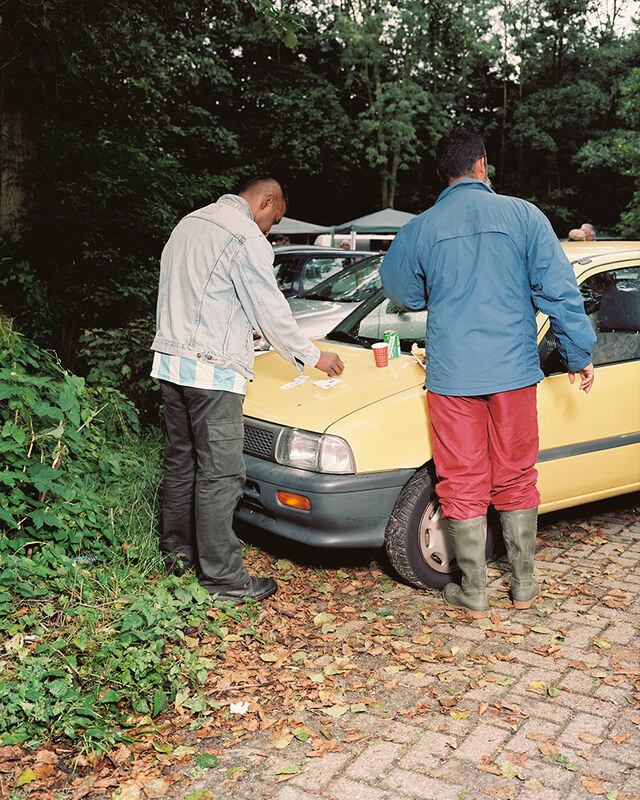 The sport is important in the Surinamese community. Issues are being discussed, liquor drunk from the trunks of the often large cars, and there’s lots of food. When Sunday ends, everyone knows everything about each other again. It’s a reference point in the social life of these men. Dedicated to Jitan Rai Rai (1949-2011). Rai was chairman of Beef-free from 1988 to 2011. Rai was very important for the club. Prim and his bird are being watched by his friends. At the game. Spectators keep a proper distance. Two referees are keeping the score on a chalkboard. Eating Roti after the game. 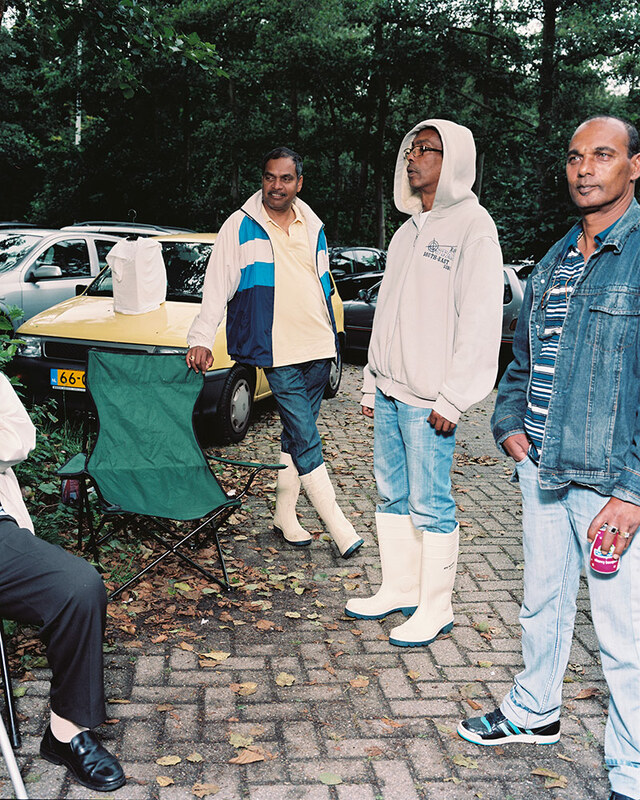 The man in the red jacket is Rai Jitan Rai, the chairman of Beef-free, from 1988-2011 (†). In between the games there is time for some smalltalk. 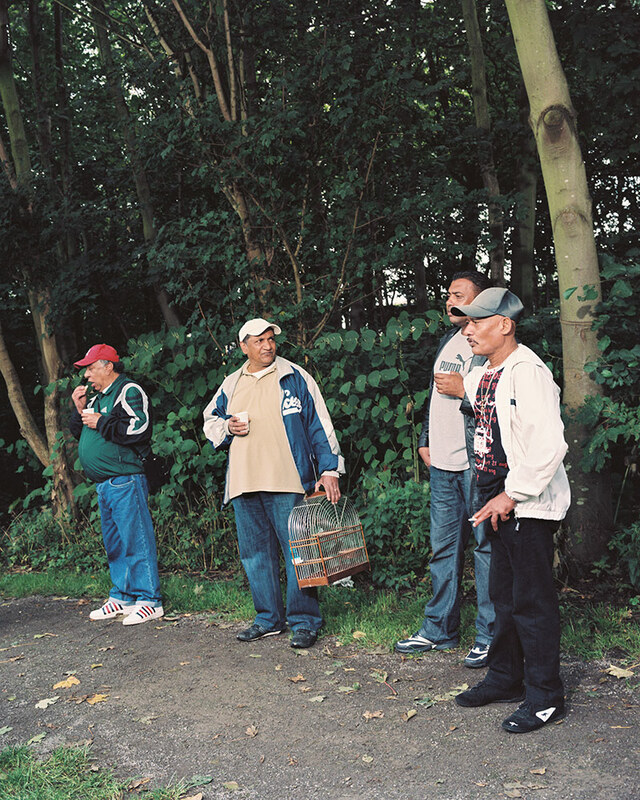 Men drinking from plastic cups. Someone checking the lottery tickets. Bird cage holding a Twa-Twa at the parking lot. Sheltering from the rain in the trunk of the car. Joy Ramdaras and his son with their bird. 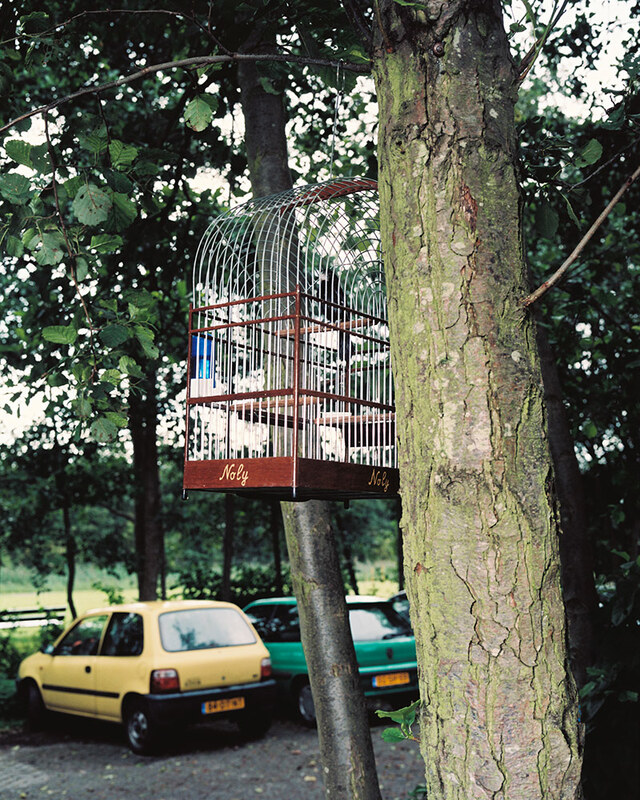 Birdcage with a Twa-Twa in the tree. Cage with a Twa-Twa on a foldable stick. 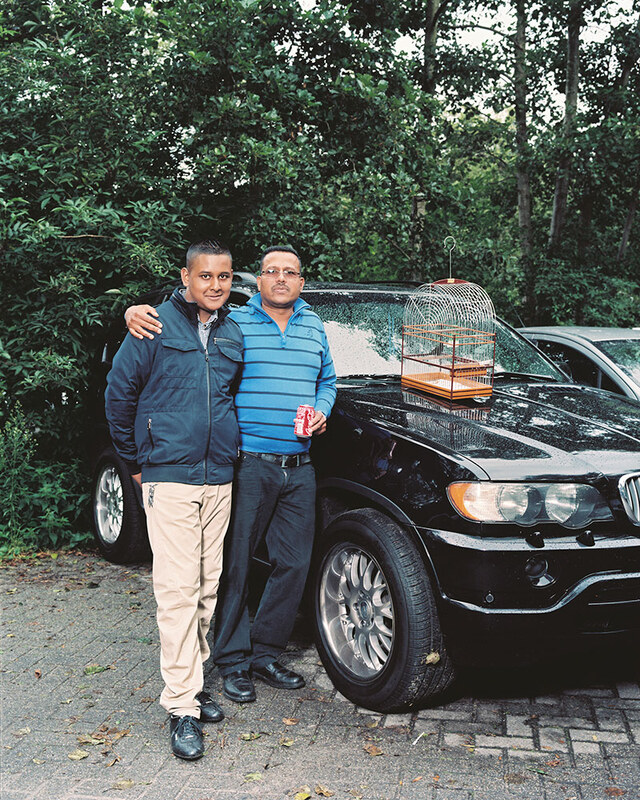 Men in the back of a car with bird. Throughout the summer, weekly sunday games are being held at this park at the Lozerlaan in the Hague. 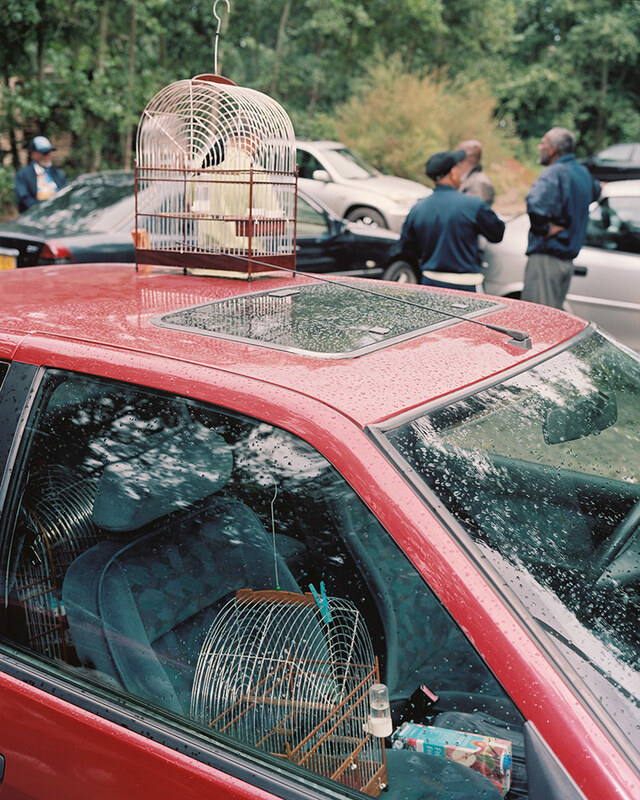 Female birds are kept inside the car. The male birds are on the car's rooftop. The parking lot. The season wasn't too good because of the bad summer.